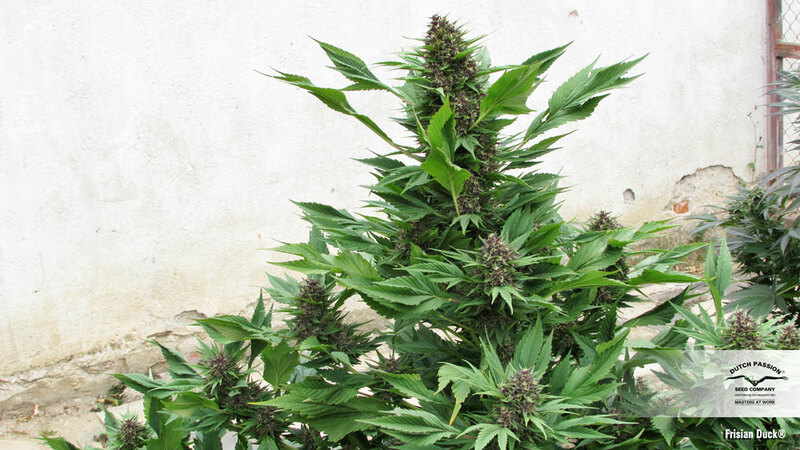 Frisian Duck® grows with unusually shaped leaves making it difficult to identify as traditional cannabis and ideal for outdoor and greenhouse growing in populated areas. The name refers to the distinctive leaf shape which looks like a ducks footprint especially during the first two-thirds of her life. 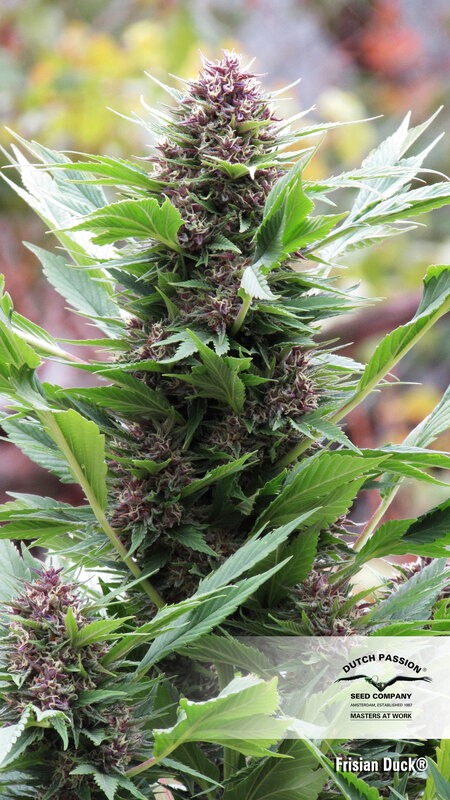 During bloom, some upper leaves may show the more traditional cannabis shape. Frisian Duck® comes from crossing Frisian Dew® with DucksFoot. This unique, robust, stealthy variety is ready to harvest at the start of October (start of April in Southern Hemisphere). Grows like a Christmas tree with beautiful purple colours during flowering and , outdoors up to 2.5 meters, indoors up to 1.5 meters. 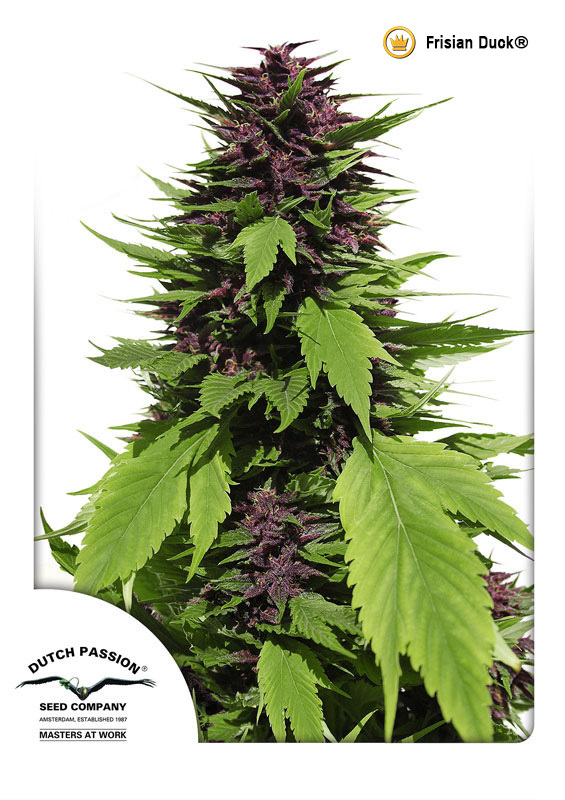 Frisian Duck® produces compact buds with spicy aromas of pine, citrus and fresh forest. 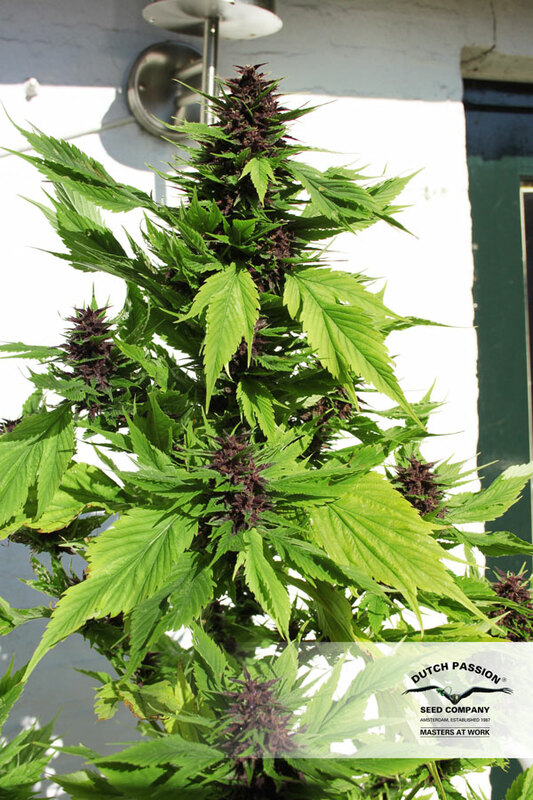 She was created for outdoor growing but also does well indoors. 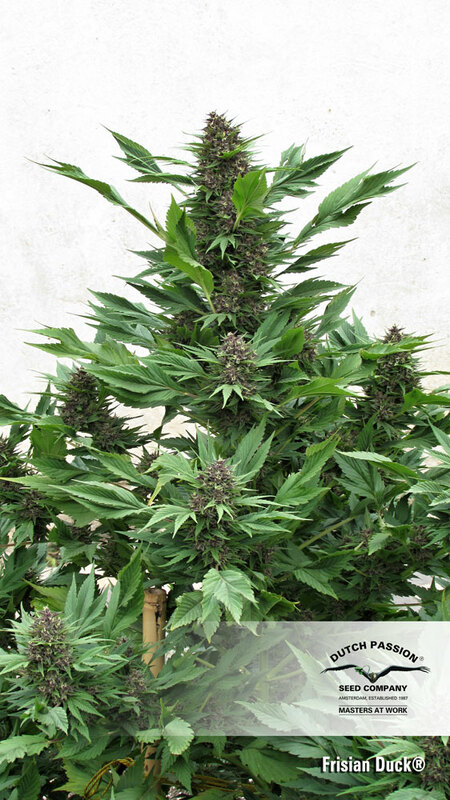 It is a unique cannabis plant in disguise; tough and easy to grow, perfect for less experienced growers. 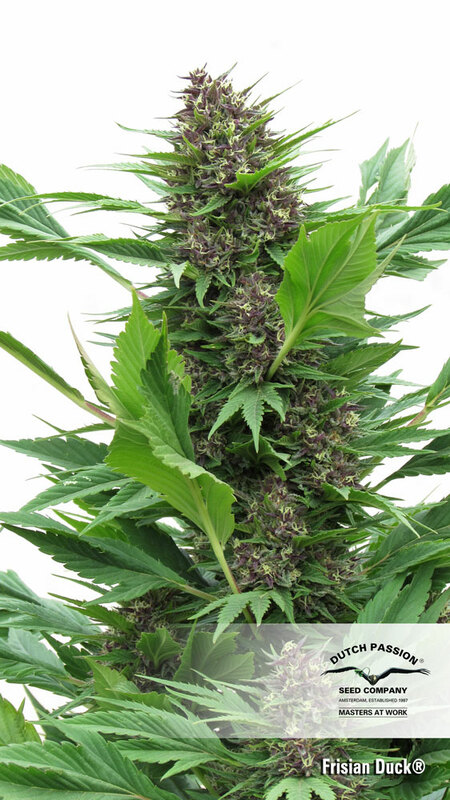 Frisian Duck® grows without being recognisable as cannabis for large parts of its life. 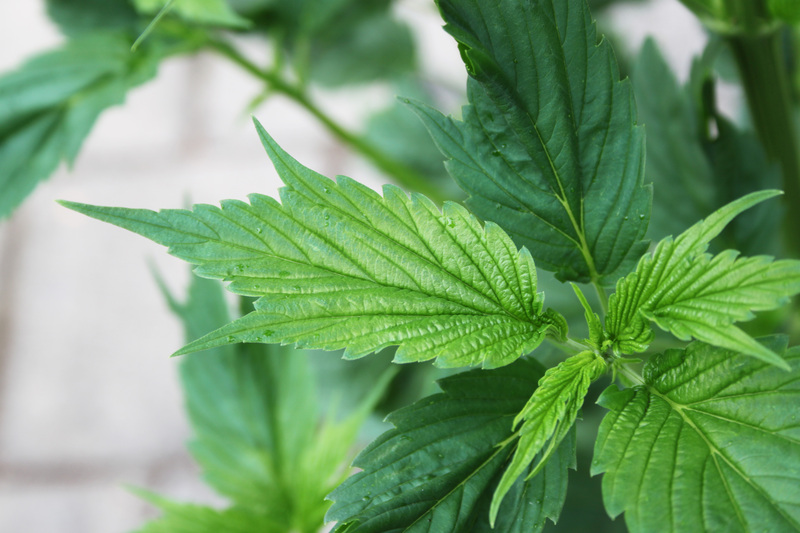 Anyone that has a quiet sunny corner in their garden, greenhouse or the countryside will now find it easier than ever to grow their own cannabis. Filipa, 30th Nov 2018. Assess harvest as you would any other variety, look for a surplus of brown/orange hairs and use a magnifying glass to assess when trichomes are turning milky/amber. Good luck ! South London polytunnel grow. Planted indoors under LED's late March, put in tunnel early May. Harvested 12th October. By then they were over 2 metres and all plants had purple buds- huge purple buds. I did put a large oscillating fan in the polytunnel to help airflow and keep humidity down for tighter buds. At time of review 6 weeks into curing and I have jar after jar of sweet smelling dark purple almost black bud. Unique high, just right. I can't wait until next year! Same again please. When do you know its ready to harvest? 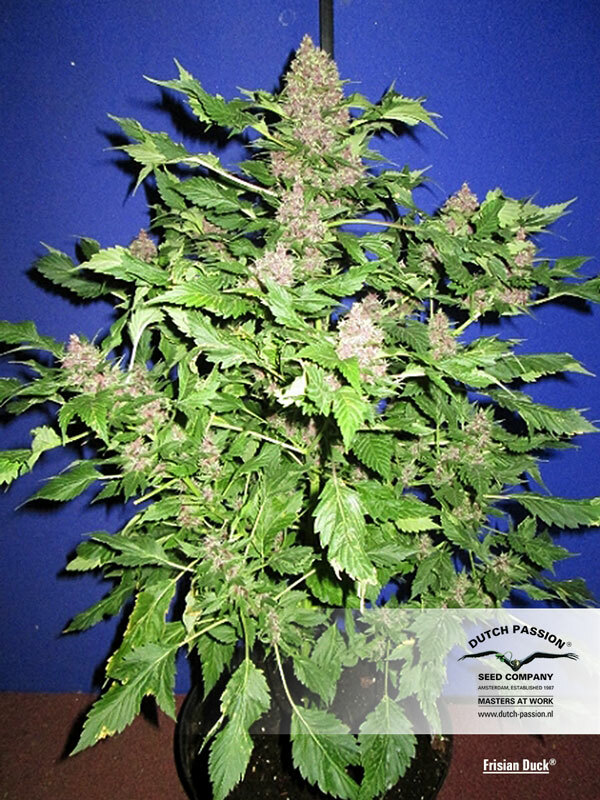 Flowered for 10 weeks; indoor LED heavy plant training, organic super soil. Some additional supplements used. Very unique effects, makes one as alert as they are dazed ! Purple and Green phenos have same about the same flavor, effects are same with the purple being slightly better to sleep to.. (Cured for over a month) I am used to “high-end” California genetics but I think it’s unjustified to call crop “mild” def an immediate an noticable high, perhaps just covered up a bit by the extreme level of relaxation... Relaxation an Dazed energy would be the thing to expect..! Flavor is unique, truly holiday smoke. Cranberry, Peopercorn am pine it’s divine! If I ever germinate these again it would be outdoor I don’t see a point of another focused operation dispite the satisfying smoke... Strong and Easygoing, with great one of a kind flavor. Don, 8/8/2018. Sorry to say that we don't have a recent terpene analysis done on this variety. And you are right, some phenotypes will want to go for an extra 1-2 weeks. If they do, they will usually swell further during that time. We tend to quote the earliest harvest time. But we recognise that harvest time is also sometimes a matter of personal preference with many people. Lots do like to give their plants an extra week or two....Good luck with the harvest. We hope you enjoyed the leaf shape! What are the main active terpenes you can identify to their strain ? Any test of specific Terpenes ? Or casual advice ? Plants are growing very well, super happy to go grow during HST/Supercrop/Manifold. Very quick to become woody so train early.. Very curious on the main terpenes of this strain, medical reasons..
Eddy, your comment Is honest & appreciated. I wish to ask you about the 8th week of flowering for this particular strain to harvest. Rarely Is this ideal harvest, usually 8 weeks Its the shortest whilst still being quality. Have you experienced these girls improving being pushed to 9-10 weeks ? Hello, I know It was stated on here that Frisian duck has a low CBD rating.. Im very confused on this, everywhere else I have read claim this strain has about a 5% CBD profile ?? These girls grow very well indoors under 600 W. Keeping the light at the right distance they vegg nicely, branch out with our without much trimming, and then fill in. Started 11,5 hours light and 12,5 hours darkness when the girls were about 45 cm tall. They don't stretch much but keep growing and filling in nicely. Really nice growing, and fun to greet them in the morning, thinking, well, they don't quck like a duck, I'll have to do that for them after I have enjoyed a smoke. :D One more review after harvest and smoking. Lovely plants. Can't wait to feel their effect. Thank you Eddy, but what do you mean by good weather? :) Autumn is starting in our country, so less and less sun, outdoor temp dropping to 5-6 degrees at night and rise up till 16-18 at day.. afraid that she won't have enought time to mature. I'm at 37 North will this strain finish ? Hello, Kind a strange, end of September, colas are big and fat, but no visible trichomes.. when does Frisian duck used to start ripening outdoors? 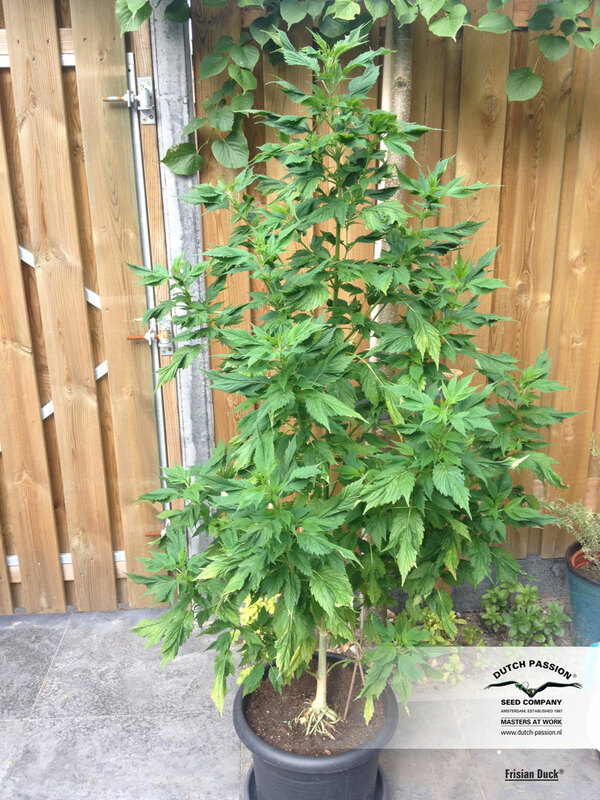 Hello, I bought your Frisian Duck seeds in May, Germinated 4 seeds with a 100% success ratio....Now in July I can say that without a doubt these plants are beautiful...l bushy, branchy, and lush.....4 ft. now and should start flowering outdoors in a couple weeks....Can't wait to taste the results....Thank you for this beautiful undercover strain! Week 7.5 :) took clones a week ago and two made it. One grew well, the other with yellow droopy tips and one shriveled up. I put this down to being my first time cloning. About to repot into large airports. Using canna terra soil and nutes, went nute-less for about 5 weeks, also using garden centre soil as I was clueless to begin with. Can't wait to plant my clones outside and watch my first two bloom :) not sure when I will start flowering yet may be soon. My space is limited. Loving the experience thanks Dutch Passion! Please cross this with AutoUltimate/Think Big/AutoDaiquiri Lime. Whatever is the biggest yielder while still being good outdoor in crap climates. Thank you. This is NOT CBD rich (i.e. CBD is below 4% in the dried flowers). 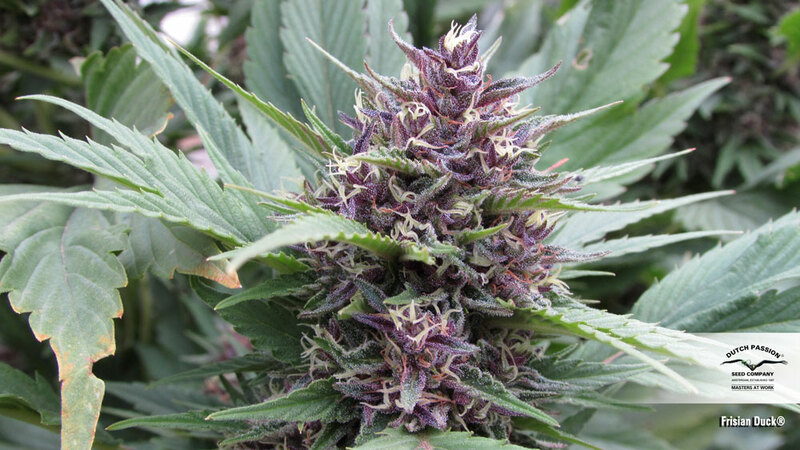 THC levels are typical for outdoor varieties, depending on grow conditions, sunlight, environmental factors etc, around 15%. Grows great, any info on CBD content? Auto version would be awesome !!!! I was really interested in your product, it looks like an amazing plant, which looks intriguing to grow as well as to smoke. The thing is, I'm located in Mexico. Is there any way your product could be shipped if expenses were paid? Please please please can we have an auto version of this? Hello which is thc/cbd content? thank you b.r. Hi! 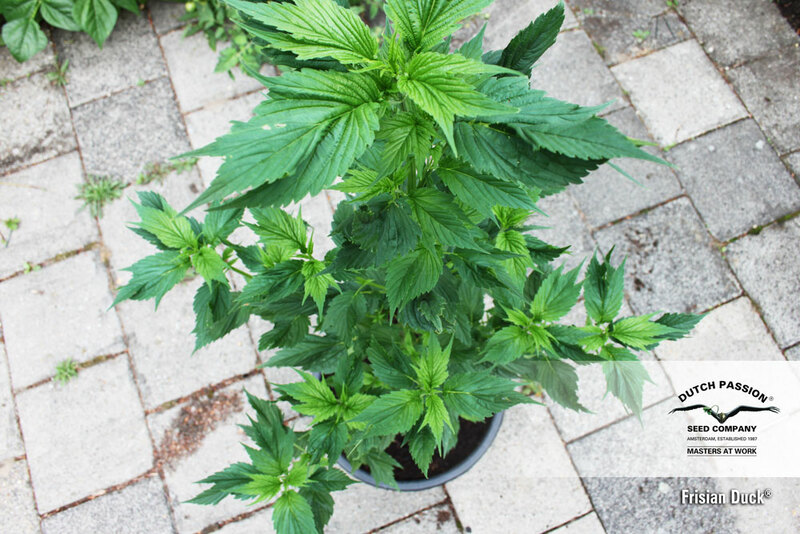 Does this plant start flowering outdoor in Finland even its not autoflowering? Would love to grow this outdoors in finland next summer. But does it start Flowering?